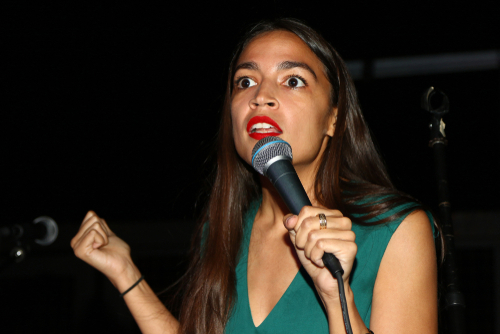 Alexandria Ocasio-Cortez push for higher taxes to fund her Green New-Deal is just the tip of the iceberg. If the people who elected her really understood what she is calling for, just maybe they would come to their senses and throw her out in 2020. Her New Deal calls for the end of milk cows, no more airplanes, we all drive electric cars, and anyone not willing to work will get guaranteed income for staying home and watching TV. She is clueless to even understand the implications of what she is even talking about. The end of air travel will send the world back to the stone age. She will then realize that ships produce more CO2 than cars show she will ban those as well and the only ships will be by sail. When there is no wind, then perhaps they can use criminals to row the boats as did the Romans (see Ben Hur). Interestingly, it would stop people flying to the States to go to University. That would end the Dreamer problem. It would end the possibility of nuclear war for you could not have rockets and space travel while we are at it. CO2 probably destroys the universe by firing rockets in space. But there is no oxygen in Space. That’s the answer. Eliminate the oxygen on the planet, we eliminate all humans, and they will eliminate CO2 which plant life needs and we have the perfect world like the moon.